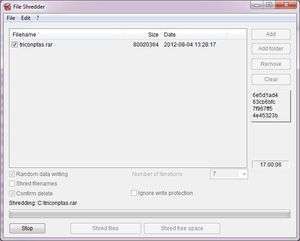 Alternative File Shredder is a free utility which allows you to completely destroy the traces of files and folders on your system. It does so by overwriting existing data on a medium with random numbers and letters or gibberish. For those wishing to remove traces of sensitive data like banking details, using this program will completely prevent the ability of restoration programs for recovering the data. For extra security, Alternative File Shredder can overwrite data several different times, making it next to impossible for any type of recovery. Version 2.330 is a freeware program which does not have restrictions and it's free so it doesn't cost anything. For security reasons, you should also check out the Alternate File Shredder download at LO4D.com which includes virus and malware tests. Additional screenshots of this application download may be available, too.